Your jewelry is more than a monetary investment! Think about why you made the jewelry purchase, who gave you the piece as a gift. There was possibly hours, days, or weeks spent shopping. Sometimes you spend time working with a jeweler to customize or engrave the piece. We pour our hearts into jewelry as a gift because of what it symbolizes. Jewelry serves as a physical reminder of life’s most cherished memories. 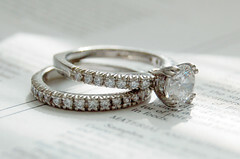 Protecting jewelry with jewelry insurance helps preserve these memories. An anniversary band that recalls the day you were married, a watch your father gave you on your graduation, or the diamond bracelet you bought yourself after that big promotion! Jewelry should be worn, not locked away! Your engagement ring, heirloom necklace, cherished pendant. These aren’t things that should be locked away. They should be worn, enjoyed, and displayed. Mosaic Insurance offers jewelry insurance and freedom from worry of theft, loss, damage, and disappearance.